As the weather in Virginia gets crisp and the rush for the best holiday gift deals begin, we find ourselves whispering about the annual office holiday party once again. 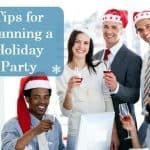 Unfortunately, those put in charge of planning the perfect office holiday party usually feel the task is challenging and mundane. There are dates to set, invitations to send out, decorations to decide on, venues to choose from, and don’t forget the catering. Plus, who really enjoys these things anyways? 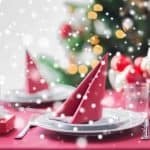 Let’s take a look at some of the hottest holiday catering trends 2018 has to offer so you can get motivated about planning your company’s best holiday party ever. There seems to be a push for all things unique when it comes to holiday party themes this year. In fact, almost all events this year have centered on the mainstream idea of having a unique theme. Of course, traditional holiday motifs are always welcome, and the ever-favorite ugly sweater parties are never going to end. But why not try something a little different this year? Winter Wonderland – Rather than follow traditional holiday décor, opt for a more neutral, wintry theme. Make it traditional or whimsical, or even comical. Use colors such as silver, white, and even specks of gold. Add snow, woodland, and sparkle elements to everything. Glassware can be crystal, linens can be pure white, and the lighting can have hints of blue to add to the classical wintry look. Want to spice things up even more? Add an element of fire to your ice by incorporating dark, fiery reds to your winter wonderland. The ideas are endless and will make for a theme your guests will never forget. Colorful Carnival – Who said holiday parties had to be, well, wintry? If you are really looking to do something different this year try tapping into your employees’ inner child by putting on an all-out winter carnival. What’s more, this theme can have its own style and feel; think vintage fun fair, Coney Island, old-time carnival, and more. Play it up by adding makeup artists to transform guests, require costumes for entrance, make it colorful and bright, and don’t forget the staple behind every good carnival: games! Whether you are looking for a more traditional feel for your office party, or want to step out of the box and do something unexpected, make sure you have something planned to set the tone of your party in a positive light from the start. Modern – Minimalist decorations with singular bold accent colors amidst black and white backgrounds and strong geometric shapes. Rustic – Earthy, organic, and natural details such as pinecones, mistletoe and trees adorned with woodland creatures. Materials like burlap, sisal, or twigs incorporate into all of the décor. Accessories – Every party needs the small details to pull the entire theme together. Centerpieces – They are easy to personalize and make your company’s party unique. 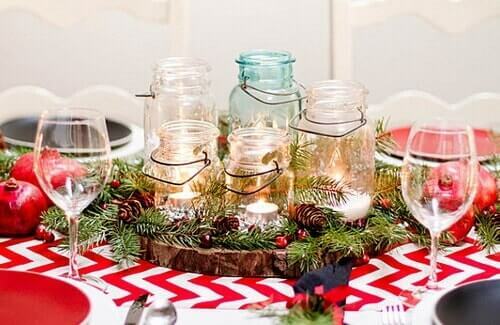 Use glass vases and add strands of lights, pine sprigs, baubles, or colorful candles inside. Mason jars – One of the hottest trends for some time now, Mason jars are versatile and can be used as centerpieces, tableware, decorations, or even containers. 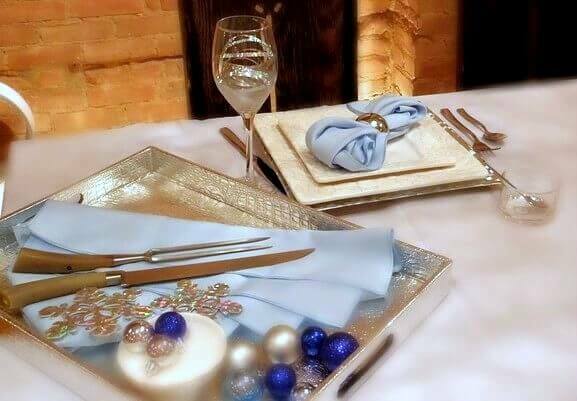 Plating trends – Change up the sizes and colors of your tableware to give your party décor more variety. Ditch traditional banquet tables and chairs – Go for comfort and style. Try rocking chairs, sofas, porch swings, or mod ball chairs to steer clear of a foldup metal banquet chair. 2018 is the year of small portions, lots of variety, and easy to eat finger foods. The traditional sit down dinner party has been losing steam for a while now as guests demand bite-sized everything. Cafesano Catering offers a large variety of finger food platters perfect for your holiday office party. In line with the holiday catering trends of 2018, Cafesano’s catering menu will provide your guests with the kind of party fare they’re looking for. Try our large selection of warm Panini sandwiches and flavorful wraps, our easy to eat homemade Grape Leaves, or even some of our grilled skewers. Catering in Dulles never tasted so good. Another trend hitting holiday parties hard this year is the idea that guests want to enjoy cuisine from a culturally diverse menu. Ethnic flavors are favored among those attending parties as people call for exotic flavors and never before tried foods. Choosing Cafesano Catering to cater your holiday party this year will surely be a hit among those looking to expand their palates. Cafesano’s menu selections are not too rich and not too spicy, but full of freshness and bold flavor profiles from Italy and the Mediterranean. 50% of all Americans eat at least one meatless meal per week. That is why savvy caterers will opt to include vegetarian alternatives to their catering menus. More people are making the shift to vegetarian diets and not simply for their main course either. The demand for lighter, healthier, more vegetable filled meals will continue to rise into the next year, so adding a vegetarian selection to your office party menu will definitely go over well with everyone in attendance. Cafesano prides itself on serving fresh and healthy dishes. In fact, the Mediterranean diet is considered by many to be the healthiest in the world. This emphasis on healthy eating is the cornerstone of Cafesano’s food choices, as reflected on the many healthy options on the catering menu. 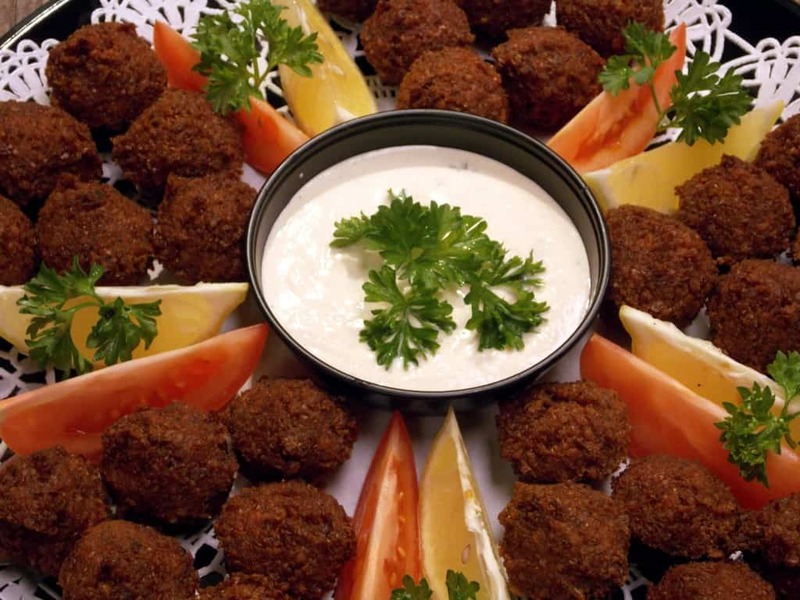 Try adding Cafesano’s famous falafel to your holiday party. Both vegetarian and delicious, this Mediterranean staple has all elements of the trending holiday foods: it’s bite-sized, ethnically unique, and healthy! Much like the vegetarian trend hitting the holiday parties in 2018, the desire for gluten-free dishes is making waves as well. Although some people engage in gluten-free eating for specific medical purposes, a large number of people do it simply to be healthy. Those same people are attending your office holiday party and would like to eat foods consistent with their normal diets. Grains like quinoa and buckwheat offer lots of nutritional value and can be incorporated into many holiday meals. Cafesano is proud to be one of the top-rated Dulles restaurants offering a gluten-free menu. It has been suggested that hummus is one of the hottest food trends this year, even out-trending salsa. High in protein and fiber, and low in fat, this chickpea based dip suits everyone. 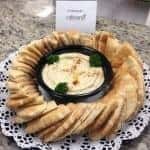 Having many flavor varieties, hummus is without a doubt one of the most popular foods you can provide your guests at the annual office holiday party. Homemade original and spicy red pepper hummus are two of the most popular dips offered by Cafesano in Dulles. Adding hummus to your catering order is sure to please your holiday party guests. 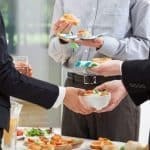 After planning your office party’s date and time, theme, decorations, and venue, make this year’s office party the very best following some of the most popular holiday catering trends of 2018. Consider using the catering services of Cafesano Catering for all of your menu needs. 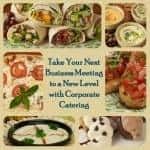 Delivering straight to your party in Northern Virginia, Cafesano Catering ensures only the freshest, most flavorful (and healthy!) Mediterranean fare will be served to your party guests. With convenient online ordering, or friendly Catering Coordinators standing by to help you with your order by phone, Cafesano guarantees your holiday party will be a success. 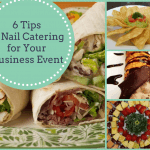 This entry was posted in Caterers in Northern VA, Catering Ideas, Holiday Parties and tagged Business Catering, how to cater a business holiday party, how to cater a holiday party, how to host a business holiday party by Cafesano. Bookmark the permalink. I think the biggest trend I have seen at my companies parties is that they lean toward healthier food. I’m not complaining since the food is all still really good, but it is definitely a little different than I’m used to seeing. That is probably why hummus has made such a big surge in popularity. I don’t know for sure if it is healthier than salsa, but it wouldn’t surprise me.